I’ve shared before that I’m a third generation IBD-er. My first and biggest inspiration helping me cope with my Crohn’s disease is my grandma, who’s had her j-pouch for almost 34 years. For women’s history month, I decided to interview her about her experience having j-pouch surgery back in the 1980’s. How did you get your diagnosis and end up needing j-pouch surgery? My first symptom was just blood in the stool. I didn’t have any pain or cramping. I saw a gynecologist and he dismissed me, saying that I was just straining when I was gong to the bathroom. When our family doctor later diagnosed me with ulcerative colitis, he told me that I was going to have real problems in about ten years. At that point, I didn’t even see a GI doctor. I don’t even remember if or how they treated me. When I started having trouble again, I would have colonoscopies at the GI doctor every year. Each time when they did a colonoscopy (without anesthesia back then! ), the disease moved a little farther around my colon and they’d start me on 60 mg of Prednisone. Eventually, it moved all the way around my whole colon. At that point, I just couldn’t get off of the Prednisone and they decided it was time to get rid of it. That was when I was referred to the Lahey Clinic outside of Boston. What was your surgery experience? I had my pouch surgery in 1985. At that point, they had only done 100 j-pouches at Lahey, and at 45, I was the oldest one to date. The surgeon explained that I would have an ostomy for three months. I ended up having it reversed after two because I had so many problems with it. My stoma was so small that it didn’t stick out into the bag and it would leak most of the time. Back then, I didn’t have access to all of the different kinds of supplies to help with this. I had the surgery in two steps. I’ve always said that they “redesigned my septic system.” I think the hardest part in the hospital was those stupid “hand grenade” drains. I did have the sweetest ostomy nurse who taught me how to change my bag- Lahey was one of the best hospitals in the Boston area at the time. She told me to eat peanut butter or applesauce before I took the bag off in the shower to slow things down. What was the period of time after your surgery like? For the first year after my reversal, I ended up back at the doctor several times because I was anemic and needed to get iron shots. I had a couple follow-up visits with the surgeon and then I didn’t go back anymore. I lived up in New Hampshire, a long drive from Boston. The surgery was still pretty uncommon- I’d go to a doctor and they’d have no idea what I was talking about when I tried to explain the pouch. Because of this, I just dealt with any problems I was having on my own and just thought it was just the way things worked after the surgery. I had trouble with pouchitis for years, but didn’t think there was anything to be done about it. It wasn’t until I landed in the hospital from a GI infection a few years ago that they scoped my pouch and I started seeing a GI again. When they checked last summer, the pouch still looks ok, even all these years later. What have you been able to do since getting your pouch? In over three decades of life with a j-pouch, I’ve traveled over 100,000 miles in our RV, gone hiking in Zion National Park, climbed waterfalls and gone snorkeling in Jamaica, and gone whitewater rafting, for starters. I’ve also finished raising my three girls and helped raise five grandchildren. We’re now retired to our winter home in Arizona and spend summers in New Hampshire. 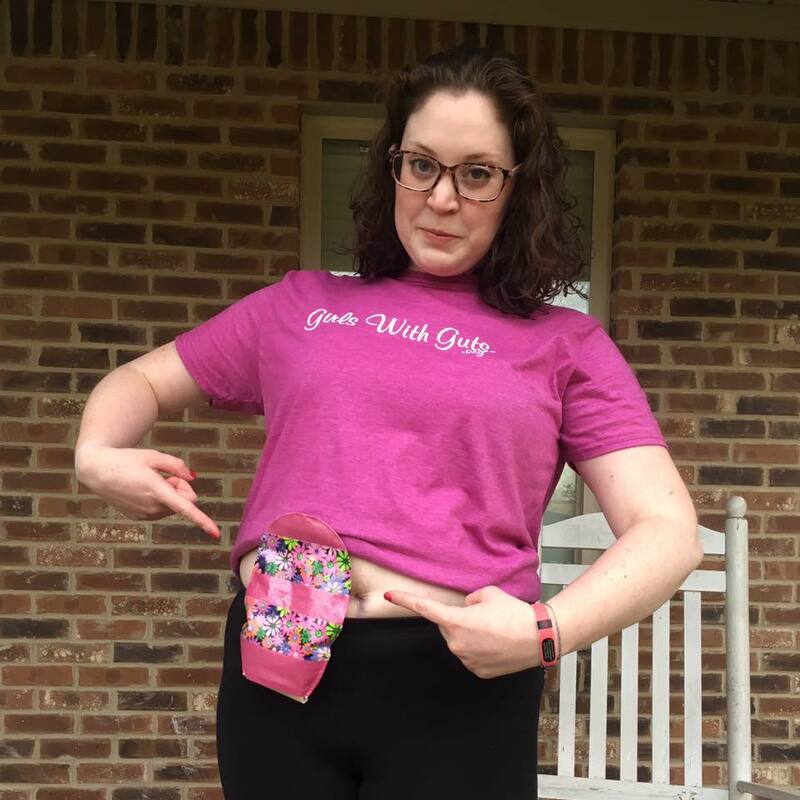 A third-generation IBDer, Kristen Weiss Sanders was diagnosed with ulcerative colitis in 2006 and re-diagnosed with Crohn’s disease in 2012 when her j-pouch began to fail. She is now a permanent ostomate and shares all of her adventures with her stoma, Roo. Kristen is excited to put her science background and grant writing skills to good use as part of the GWG Board of Directors. She credits the constant example and support of the strong women in her family for her determination to thrive with Crohn’s disease and use her IBD journey to empower others.